I was absolutely delighted to discover this geek tribute cookbook (kickstarter). It promises to be a playful, laughable edition to gamer parties with recipes that are hopefully as tasty as they are enjoyable. If you watch Jimmy Fallon/The Tonight Show (which I don’t) you’ve already seen the amazing suggestion box raps that the house band “The Roots” and their lead MC Black Thought (Tariq Luqmaan Trotter) perform. If not, prepare to be spellbound by the “Harry Potter Rap”. See you on the Hogwarts Express — all abooooard! Grateful shout out to rapgenius.com which is where I found the lyrics in print. Add snark and rhymes with a dash of cosplay. Season with fandom rivalry. Bake on high in a well-greased Youtube pan. Serve. Sadly that was not to be. A prolific actress of stage and screen, O’Mara will be much missed and will be fondly remembered. She made an indelible mark on the Whovian Universe for her role on Doctor Who as the evil Time Lady, The Rani. 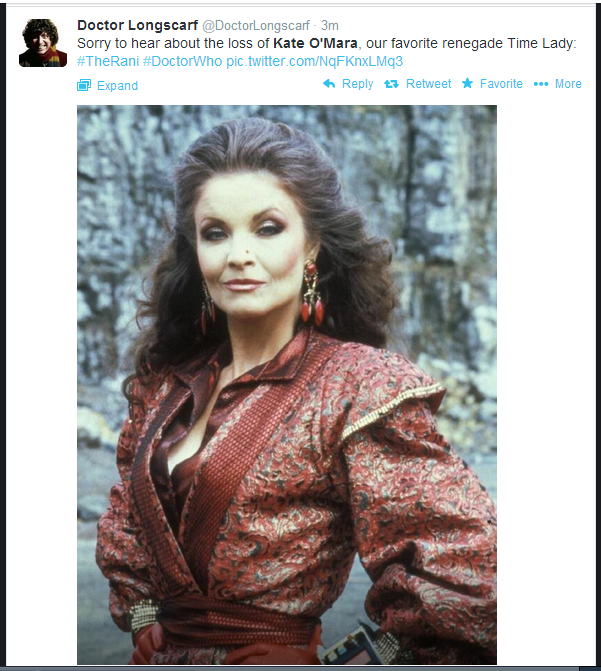 Fans and colleagues tweeted their respects, including Colin Baker who played the sixth incarnation of The Doctor. The Doctor: There’s more where that came from. The Tenth Doctor: [Offering his sonic screwdriver.] Need this? The Fifth Doctor: No, I’m fine. The Doctor: There’s an old Earth saying, Captain. A phrase of great power and wisdom and consolation to the soul in times of need. Doctor: I can’t stand burnt toast. I loathe bus stations. Terrible places. Full of lost luggage and lost souls. Ace: I told you I never wanted to come back here again. Doctor: And then there’s unrequited love. And tyranny. And cruelty. Doctor: We all have a universe of our own terrors to face. Ace: I face mine on my own terms. DOCTOR: They never really stop. Unless you’ve been in a well at the bottom of the earth or held captive by the Cult of Skaro, you’ve probably heard that BBC is celebrating the 50th anniversary of Doctor Who with a mind-blowing episode. 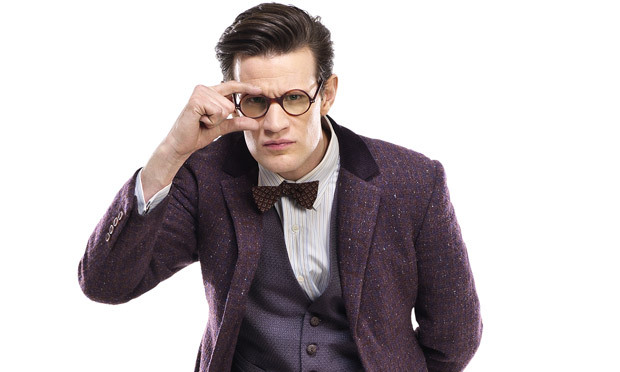 “The Day of the Doctor” airs November 23 2013. It will be “simulcast” ie broadcast in 75 countries at the same time… and (in some places) in 3D. It has been described by one of the producers as “a love letter to the fans”. What marvelous geekery is this? Bill Nye, the science guy, doing Beethoven cosplay on Dancing With The Stars! Love, love, love him in everything he does and this is no exception. Fiercely funny. While a fan favorite, Nye has scored consistently low with judges. Unfortunately, the “trip” that his professional dance partner, Tyne Stecklein, mentions (and seen here in this video) during their Paso Doble routine on Monday resulted in a serious knee injury. Not only is it likely to take Nye out of the competition, he may require surgery. Big shout out to io9.com who saw this first! (And who provides us geeks and nerds with much web-surf-worthy material.) Not so cool is they forgot to mention the name of the mind-blowing grad student. It’s Tim Blais. Connect with him. Read his master thesis. Though I doubt it’s as much fun as his youtube channel “A Capella Science” and this brilliant send-off called “Bohemian Gravity”. I’m not quantum theory educated enough to critique what he’s saying… or follow it completely (but the lyrics are on the youtube page if you want to sing along or google the references)… but WHO CARES? It’s hilarious, engaging, well executed, and includes a falsetto-singing Einstein sock puppet. Anyway… how much of Queen’s version of Bohemian Rhapsody did you understand in the first place? Right. Just enough to sing along -at the top of your lungs.